In all their years at the funeral home, Janet and Michael Savoy had never seen anything like the viewing for 19-year-old Thalia Stevenson. That's because they had never seen a Gypsy funeral before, complete with rituals, incantations, and a very special gold coin placed beneath the dead girl's hands.... When that coin is stolen, a horror is unleashed! At first it seemed to take a bit to get going, but every bit was necessary to the story. Very engaging, talented writing and performance at it's best. EXCELLENT! Very imaginative and extremely entertaining! Love the twists and turns of the plot! Kudos to Deborah Leblanc! 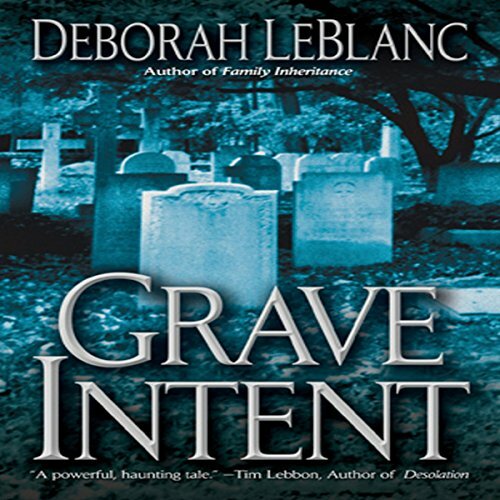 I would recommend Grave Intent to everyone! The only thing I would recommend is that the Narrator pronounce the name of the town, Brusly, correctly. It is pronounced "Brew-Lee."